Redshirt-junior setter Peter Heinen (8) sets the ball to redshirt-freshman middle blocker Driss Guessous (4) during a match against Ball State Feb. 26 at St. John Arena. OSU lost, 3-1. A five-game homestand ended on a sour note for the Ohio State Buckeyes. After sweeping a pair of matches against Grand Canyon over the weekend, OSU could not keep the momentum going, losing to No. 14 Ball State 3-1 (20-25, 26-24, 25-20, 26-24) Wednesday at St. John Arena. 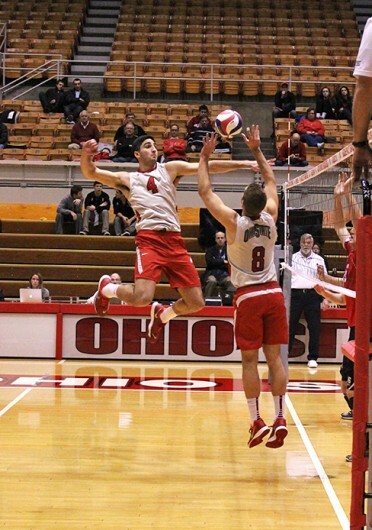 The loss puts the Buckeyes back at .500 for the season at 7-7, with a 4-3 record in the Men’s Intercollegiate Volleyball Association conference. OSU started strong, taking the match early with a score of 25-20 in the first set. “We started off strong and looked good and promising from there, I don’t know if we get complacent but we definitely allowed them some life and let them get back into the match,” junior outside hitter Michael Henchy said. Coach Pete Hanson said the team is going to take a look at its game as a whole as it prepares for its next match, next Wednesday at Indiana University-Purdue University at Fort Wayne. “We have to keep working on all phases of the game, we don’t have one phase that is consistent in what we need to have happen. We will continue to work on our offense and defense, I think we need some overall improvements, we have been working hard, we just need to stay at it and get better,” Hanson said. The Buckeye offense came off strong in the beginning, but started lacking when the Cardinals turned it up defensively, Hanson said. Three Buckeyes led the team with double digit kills. Freshman outside hitter Miles Johnson had tallied a career-high 16, while redshirt-freshman middle blocker Driss Guessous and Henchy contributed 12 kills each. Johnson said the team needs to work on its unity. “We need to have a stronger team, instead of strong individuals. Tonight, there was too many holes in our core group of guys,” Johnson said. Match time between the Buckeyes and IPFW is set for 7 p.m.